We are focusing on embedding Indigenous Education into our classrooms. To this end, we have provided teachers in the TRC +1, +2 and +3 schools with the following books for their classrooms. 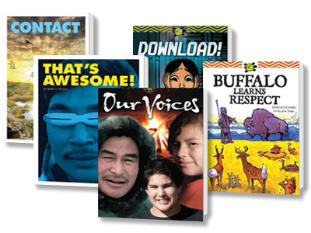 Turtle Island Voices is a series of 30 levelled readers designed to foster awareness and understanding of Aboriginal cultures for both Aboriginal and non-Aboriginal students in grades 1–3. Each grade in the series offers three traditional stories, four modern stories featuring Aboriginal protagonists, and three informational texts on a variety of engaging topics. The schools have been asked to prepare a display for the TRC+3 Gatherings (to be held at Maxville Fairgrounds and Pineview Public School in May) of how they have focused on Indigenous Education in their schools.